A-12 and SR-71, a tale of two Blackbirds. The A-12 and SR-71 Blackbirds are nearly identical in size, shape, and performance. The famous Lockheed Skunk Works designed both airplanes but they were operated by different agencies for different missions. The CIA needed a spy plane to collect intelligence on military capabilities and maneuvers before the start of war. 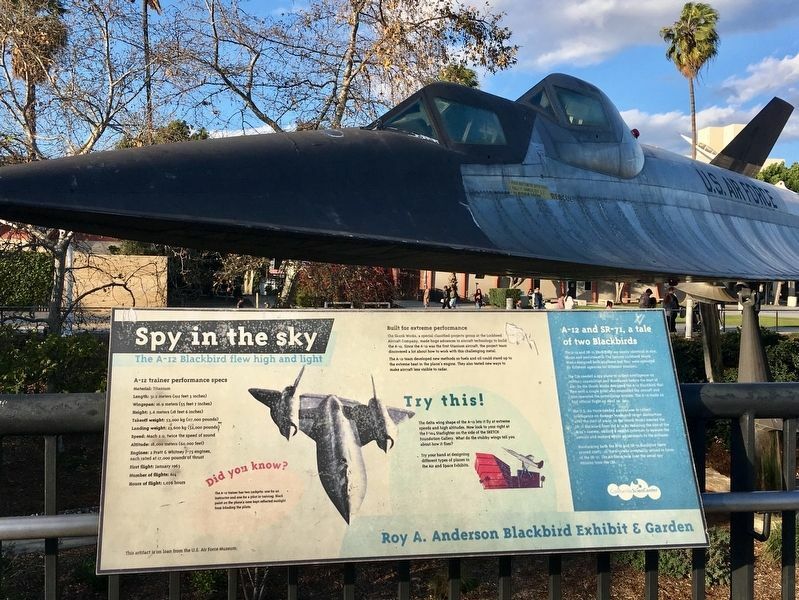 So the Skunk Works designed the A-12 Blackbird that flew with a single pilot who controlled the aircraft and also operated the surveillance sensors. The A-12 made its first official flight on April 30, 1962. The US Air Force needed a spy plane to collect intelligence on damage levels and target destruction after the start of a war, so the Skunk Works created the SR-71 Blackbird from the A-12 by reducing the size of the A-12’s camera, adding a second crewman to operate the sensors and making minor adjustments to the airframe. Maintaining both the A-12 and SR-71 Blackbird fleets proved costly, so the A-12 was eventually retired in favor of the SR-71. The Air Force took over the aerial spy mission from the CIA. 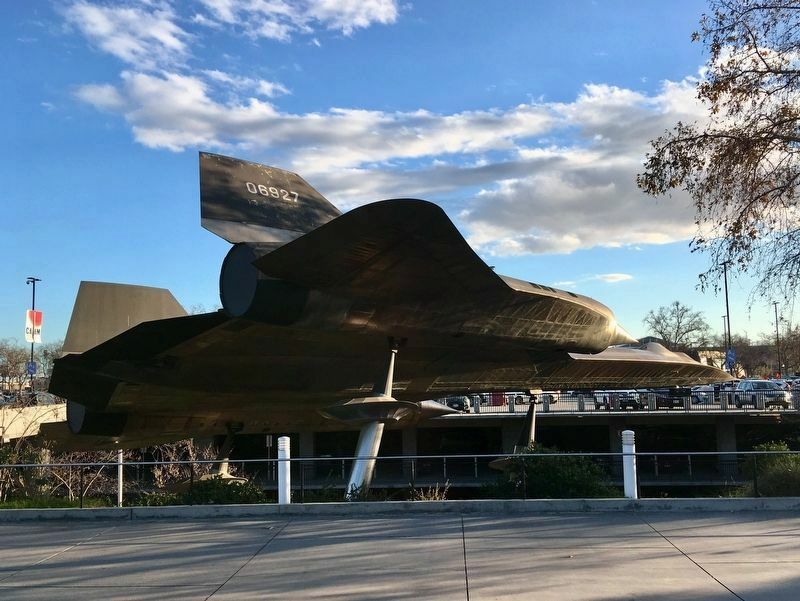 The Skunk Works, a special classified projects group at the Lockheed Aircraft Company, made huge advances in aircraft technology to build the A-12. Since the A-12 was the first titanium aircraft, the project team discovered a lot about how to work with this challenging metal. The A-12 team developed new methods so fuels and oil could stand up to the extreme heat in the plane's engine. They also tested new ways to make aircraft less visible to radar. The delta wing shape of the A-12 lets it fly at extreme speeds and high altitudes. Now look to your right at the F-104 Starfighter on the side of the SKETCH Foundation Gallery. What do the stubby wings tell you about how it flies? 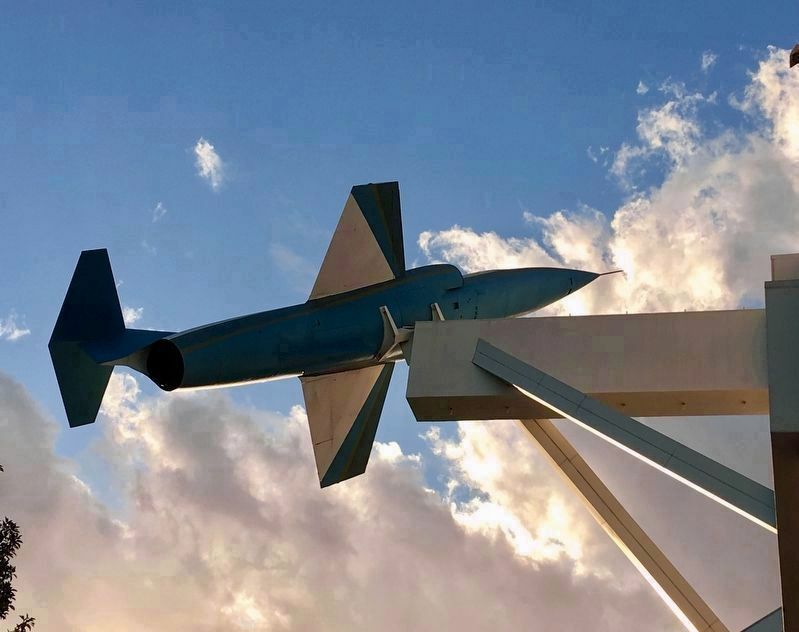 Try your hand at designing different types of planes in the Air and Space Exhibits. The A-12 trainer has two cockpits: one for an instructor and one for a pilot in training. Black paint on the plane's nose kept reflected sunlight from blinding the pilots. Length: 31.2 meters (102 feet 3 inches). Wingspan: 16.9 meters (55 feet 7 inches). Height: 5.6 meters (18 feet 6 inches). Takeoff weight: 53,000 kg (117,000 pounds). Landing weight: 23,600 kg (52,000 pounds). The F-104 can be seen in the background at top left. twice the speed of sound. Altitude: 18,000 meters (60,000 feet). Engines: 2 Pratt & Whitney J-75 engines, each rated at 17,000 pounds of thrust. Hours of flight: 1,076 hours. This artifact is on loan from the U.S. Air Force Museum. Erected by California Science Center. Location. 34° 0.917′ N, 118° 17.08′ W. Marker is in Los Angeles, California, in Los Angeles County. Marker is on State Drive west of Figueroa Street. Touch for map. In Exposition Park, near the California Science Center, next to the parking structure. Marker is at or near this postal address: 600 State Dr, Los Angeles CA 90037, United States of America. Touch for directions. Other nearby markers. At least 8 other markers are within walking distance of this marker. 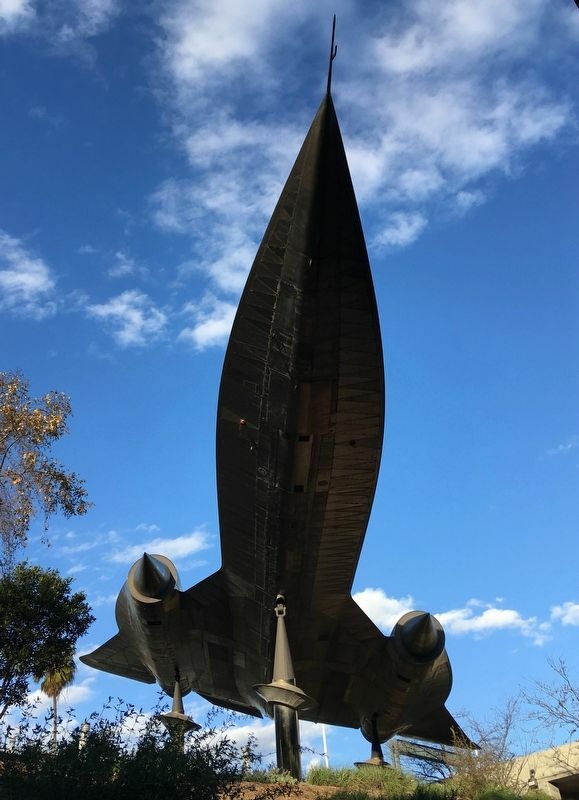 Lockheed F-104 Starfighter (about 600 feet away, measured in a direct line); Los Angeles Memorial Coliseum (about 800 feet away); University of Southern California (approx. ¼ mile away); A Trojan for Life (approx. 0.3 miles away); The Oldest University Building in Southern California (approx. 0.3 miles away); Teaching and Learning (approx. 0.3 miles away); Petrified Tree from the Arizona Forest (approx. 0.3 miles away); John C. Argue Plaza (approx. 0.3 miles away). Touch for a list and map of all markers in Los Angeles. Regarding Spy in the Sky. To replace previous spy planes like the U-2, the CIA needed an aircraft that flew higher, faster, and was more difficult to spot on radar. So the Skunk Works created the A-12 Blackbird, possibly the world's first stealth aircraft. Designed so a single crew member could both pilot the plane and operate its high-resolution camera system, the A-12 made its first official flight on April 30, 1962. The Air Force liked the performance of the A-12 and ordered the SR-71, a slightly different version of the aircraft. 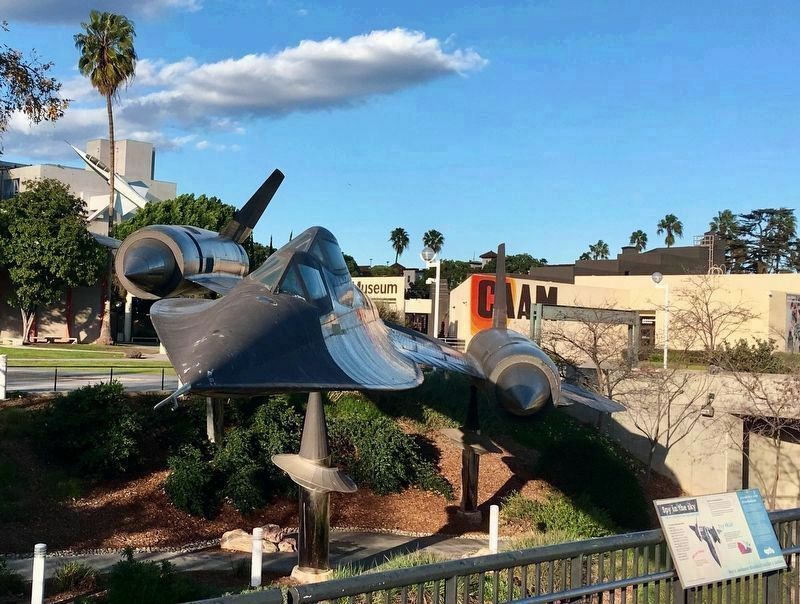 In addition to cameras, the SR-71 carried sophisticated intelligence equipment, used to spy on the radio conversations and radar capabilities of the enemy. The SR-71 needed a second crew member to operate the new equipment, which resulted in a slightly larger and slower aircraft. Maintaining two fleets of Mach 3+ spy planes proved too costly, so the CIA retired the A-12. The Air Force took over the aerial spy mission with the SR-71. flew at speeds of 2,200 miles per hour (Mach 3+) at altitudes approaching 90,000 feet. More. Search the internet for Spy in the Sky. Credits. This page was last revised on March 6, 2019. This page originally submitted on March 3, 2019, by Craig Baker of Sylmar, California. This page has been viewed 65 times since then. Photos: 1, 2, 3, 4, 5, 6. submitted on March 3, 2019, by Craig Baker of Sylmar, California. • Andrew Ruppenstein was the editor who published this page.